Update men, Km 40: Romain Guillaume is 29 seconds ahead of Drew Scott, at 2:25 we have the French connection with Sylvain Sudrie, Jeremy Jurkiewicz, Bertrand Billard and Anthony Pannier. 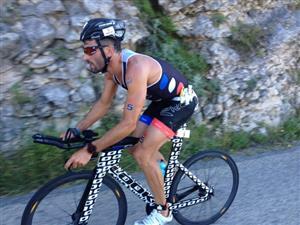 Romain Guillaume passed the timing at Km 56: His lead over Drew Scottt is 56 seconds. 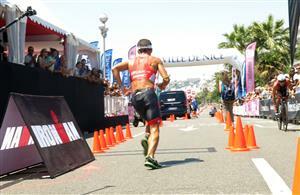 Victor del Corral was a way behind in the water, but he is always capable of a great run. Sudrie is at 3:09 in third place, followed by Bertrand Billard and Anthony Pannier. Jeremy Jurkiewicz lost contact to those three - he is at 3:53. Km 49 women: Snow leads, Collonge + 0:13. 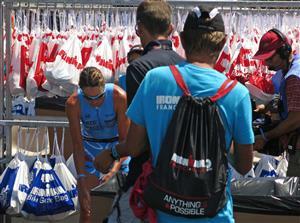 Boris Stein is a great biker and runner - will he make up time on this hard course? Boris Stein seems to be one of the few athletes that are able to hold Romain Guillaume's pace although he is far away from the leader at the moment. He is at 8:51 through 56 kilometers. 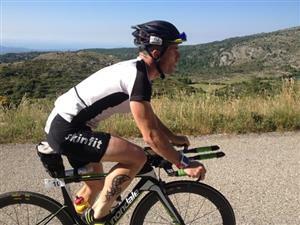 Guillaume's split for the first 56 km is 1:28:35, Scott had a 1:28:59, Stein had a 1:30:48 and Sudrie a 1:31:21. Drew Scott has a great rookie race so far. 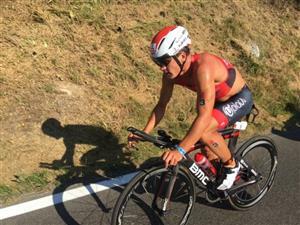 Romain Guillaume leads the race thanks to a great bike performance. The course gets tougher and Romain Guillaume seems to be even stronger: He has extended his lead up to 1:40 over Drew Scott - that's what we hear from the village of Gourdon at Km 64. The group with Sudrie, Billard and Pannier is at 3:35, Jurkiewicz at 5:00. Jeanne Collonge is hammering. Her lead over Cait Snow is 1:42 at Km 56. KM 56: Lisa Roberts is at 6:38 in third place. Emma Pooley is in fourth at 8:31. 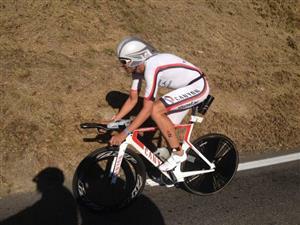 On the way to Col de l'Ecre we have some moves in the pro field: Romain Guillaume made a move to open up a gap of 2:50. Anthony Pannier - in fifth place at the moment. 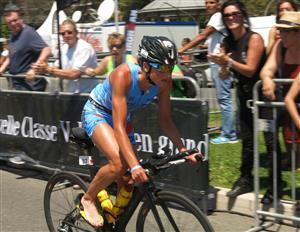 Jeanne Collonge is 2:55 ahead of Caitlin Snow, that's what we hear from Km 60. Victor del Corral is at 12:50 through 70 kilometers - and in 9th place. That will be a really tough marathon. Boris Stein had a super fast start just as Drew Scott and - for sure - Victor del Corral. Jeanne Collonge is on the final 20 kilometers. Her lead is 5:20. Boris Stein on the way into his marathon. Romain Guillaume is at the first turnaround. He has managed the first 5.25 kilometers in 20:39 minutes. 8:12 - that's the gap between Romain Guillaume and Boris Stein after 5.25 kilometers. Stein made up 17 seconds. Bertrand Billard is at 9:29 through 5.25 km of the run. Jeanne Collonge is on the way to the transition - make ready for a local leader, Nice. Boris Stein is making up ground, he is 7:29 minutes behind through 10.5 km of the marathon. Victor del Corral is in third now - 9:07 behind. He made up another 2 minutes on the last 5.25 km. His split for the first 10.5 kilometers: 38:04! Emma Pooley is off the bike with the fastest split in 5:16:34 - she is 8:54 behind the lead. 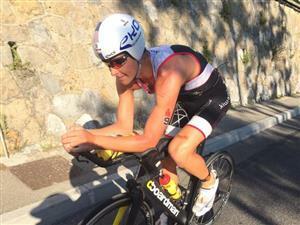 In fourth we have Lisa Roberts +9:34. Drew Scott seems to be struggling. 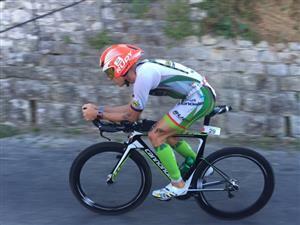 He was in fourth at Km 5.25 - now he is in 6th, but he lost more than 2 minutes in the heat.